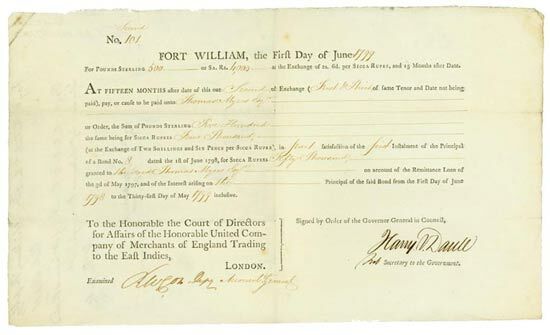 Fort William (Calcutta), 01.06.1799, Bill of Exchange drwan on the East India Company in London for £ 500 (4.000 Sicca Rupees) in part repayment of the principal Bon of 50.000 Sicca Rupees dated the 1st of June 1798, #101, 20,9 x 35,3 cm, Knickfalten, OU, Erhaltung VF, gedruckt auf Wasserzeichenpapier der East India Company, Wasserzeichen mit dem Wappen. Uns bisher völlig unbekanntes Dokument aus einer alten Sammlung! Fort William (Calcutta), 01.06.1799, Bill of Exchange drwan on the East India Company in London for £ 500 (4.000 Sicca Rupees) in part repayment of the principal Bon of 50.000 Sicca Rupees dated the 1st of June 1798, #101, 20.9 x 35.3 cm, folds, Condition VF, original signature, printed on watermarked paper of the East India Company, watermark with the coat of arms. From an old collection, we didn’t know this deocument before! After the old trade routes from India and the Far East to Europe were blocked by the Turks and Mongols in the 14th and 15th centuries the Europeans had to find alternatives. At the instigation of Henry the Navigator, Vasco da Gama became the first European reaching India by sailing round the Cape of Good Hope. With the coalition of Spain and Portugal, the two biggest seafaring nations at that time, England also increased its trading power. As Queen Elizabeth I intended to strengthen England’s position she granted a charter to the “Company of Merchants of London trading into the East Indies” on 31 December 1600. The company held the English trade monopoly in Africa, Asia and America at first for 15 years. As the business was already very successful, in 1609 the monopoly was extended indefinitely. The next decades were marked by fighting against the Dutch East India Company (V.O.C.) for the hegemony in trading with the East Indies. In 1709 the company merged with an upstart competitor to form the United Company of Merchants of England trading to the East Indies (E.I.C.). In the 18th century besides trading the E.I.C. had its own army and in the 1750s defeated large forces of Indian and French troops. The company assumed the administration of the major part of the Indian subcontinent. In 1834 the company lost its commercial character by law. From this time on it was an agency of the British government only. 24 years later, 1858, after a major Indian mutiny, the government took over the direct control of the company and of British India. After more than 270 years the E.I.C. was dissolved in 1874.